On Scene: Badge Builder Update & lots of NEW badges! Badge Builder Update & lots of NEW badges! 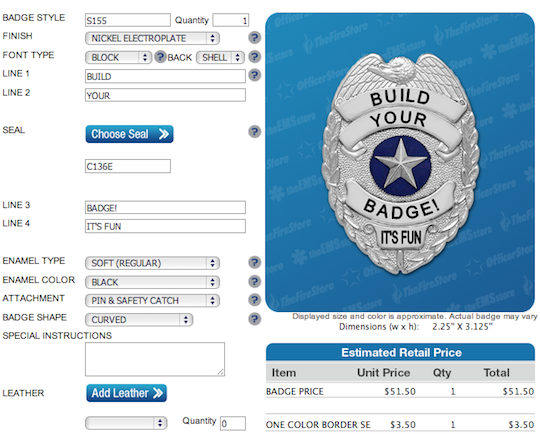 One of the great features of our website is the ability to build your badge using the Build It-See It-Buy It program. You get to virtually build your entire badge from scratch, allowing you to choose the design with the exact layout, finish, enamel type, lettering font, seal style and more that you want. It displays your text and coloring and seal choice before your eyes, leaving you lots of room to finagle and play until you get the exact look your heart desires. With this new release and update of the Badge Builder, our product offering is more than quadrupling. Meaning, you should be able to find exactly the badge that's perfect for you, no excuses. The new, updated badge builder is cleaner and easier to use than our other system, so we think you'll find building badges to be better than ever! Enjoy the Smith & Warren or Blackinton selection of badges, and start your badge building experience, today.